During the month of September 2014, the Khaled bin Sultan Living Oceans Foundation conducted a research mission to the Great Barrier Reef as part of the Global Reef Expedition. In response to the some of the reef’s decline, the Great Barrier Reef Marine Park put new regulations in place in 2004. They created blue zones which could be fished, green zones as no take zones, and pink zones that were no-take and no-entry. The Foundation’s research expedition conducted identical surveys in the pink, green and blue areas to determine differences in reef health and fish population between these zones. 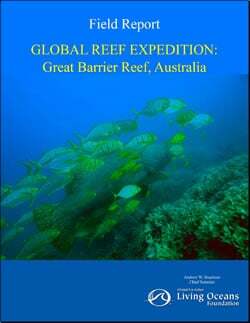 The Khaled bin Sultan Living Oceans Foundation completed a detailed assessment of the status of coral reefs and coral reef species on the northern Great Barrier Reef, Australia between September 1, 2014 and October 2, 2014. Partners contributing to this project included scientists from Wildlife Marine, University of Queensland, James Cook University, Scripps Institution of Oceanography, University of the Philippines, National Museum of Marine Biology and Aquarium Taiwan, University of Hawaii-Manoa, Woods Hole Oceanographic Institute, University of Southern California at Santa Barbara, Atlantic and Gulf Reef Assessment program, and Flinders University. The main objective of the research was to evaluate the effects of different management regimes on reef fish, coral and benthic communities on selected reefs in the northern Great Barrier Reef. A total of 30 reefs between 11° and 15° south latitude were selected for evaluation. The experimental design included 10 triplicates, each represented by a reef in the Preservation (Pink) Zone, Marine National Park (Green) Zone and Habitat Protection (Blue) Zone, spread across inner, mid-shelf and outer shelf locations. On each of the 30 reefs, six sites were randomly selected; three were located on the windward and three on the leeward side, for a total of 180 sites. Surveys focused on 10 m depth, with additional data collected between 5-30 m when possible. At each site, replicate long-distance shark and pelagic fish surveys (400 m X 10 m transects), reef fish assessments (4 m X 30 m transects), coral assessments (1 m X 10 m belt transects), photographic transects (1 m X 10 m), benthic assessments (10 m point intercept surveys) and rugosity measures (10 m chain transects) were completed. Additional rapid assessments using the Eye of the Reef (5 m radius) circular swim method were undertaken to collect semi-quantitative data on cover, growth forms, abundance and condition of reef building corals and other resilience data. Over the 30 days, surveys were completed at 166 sites on 29 of the 30 proposed reefs and 145 shark and pelagic fish surveys at 74 stations on these reefs. Scientists conducted a total of 565 reef fish surveys, 864 benthic surveys, 432 coral surveys, 381 rugosity assessments, and 1,932 photo-transects within these 166 sites. The main challenges encountered were 1) rough seas and strong winds, and 2) unusually long transits from the M/Y Golden Shadow to survey locations because the anchorages for the M/Y Golden Shadow that were permitted by the GBRMPA were often a great distance away from the selected sites. As a result, 14 stations were not completed. This included two sites on Yule Detached Reef, two on Wood Reef, four on Eyrie, and two on UN 11-122. Also, UN 11-261 was eliminated because it was not representative or comparable to the matched pink and green zones. This reef was completely submerged with a poorly developed, algal-covered hard bottom at 17-25 m depth, minimal coral cover and structure, and an absence of a 10 m depth contour. Five Reefs was substituted for this site, but only two stations were completed.